Shaping up for a triathlon is serious business. Triathlon Training For Dummies is packed with insider tips and proven methods for training for a triathlon and pumping yourself into the best possible shape by race day. It helps you find the motivation you need to stick to your program, eat better to maximize your energy, and prevent injures both before and during the race. 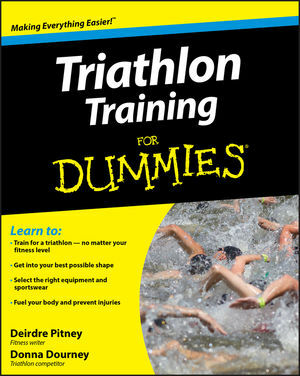 Triathlon Training For Dummies comes complete with resources for finding triathlons near you, lists of items to bring along on race day, and tips on registration formalities and racing etiquette. Deirdre Pitney is a freelance writer who writes articles on women's issues, fitness, and wellness, and is actively training for a triathlon. Donna Dourney has completed a Half-Iron and full Ironman Triathlon and has served as a personal trainer for clients, tri clubs, and first-time athletes. Part I: Starting Your Triathlon Training. Chapter 1: Training for a Multi-Sport Event. Chapter 2: Choosing Your Event. Chapter 3: Gearing Up with the Right Equipment. Part II: Taking It One Sport at a Time: Swim, Bike, Run. Chapter 4: Getting Ready: Body and Mind. Chapter 5: Swim: Taking the Plunge. Chapter 6: Bike: Cycling Strong. Chapter 7: Run: Finding Your Stride. Chapter 8: Putting It All Together. Part III: Training for Your Triathlon. Chapter 9: Living like an Athlete. Chapter 10: Training Schedules: From Super Sprint to Ironman. Chapter 11: Strength Training and Stretching. Chapter 12: Coping with Injuries. Part IV: Planning for Race Day. Chapter 13: Counting Down to Race Day. Chapter 14: Race Day: Ready, Set, Go! Chapter 15: After You Finish Your Triathlon. Chapter 16: Ten Reasons You Should Do a Triathlon. Chapter 17: Ten Triathlon Myths Debunked. Chapter 18: Ten (Or So) Items to Bring on Race Day. Chapter 19: Ten (Or So) Resources for Finding Triathlons.